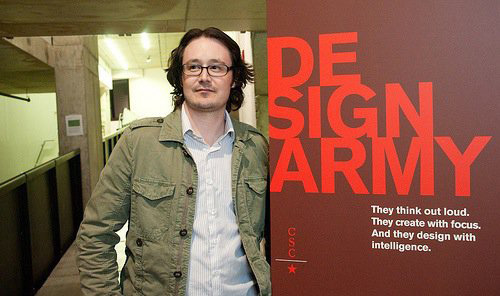 Owners of Design Army, Pum and Jake Lefebure, have donated 100% of their speaking and judging fees to the AIGA DC Continuum Fund Scholarship in 2009 and 2010. Some of these events include speaking at Design Madison, AIGA Blue Ridge, AIGA West Michigan, AIGA Baltimore, and Columbus Society of Communicating Arts. HOW International, ADDY New Mexico, ADDY Akron, and NORI Awards are all judging events where the money earned was applied to the AIGA DC Continuum Fund Scholarship. AIGA DC recently connected with Design Army to find out what makes them tick and why they donate to our scholarship fund. What compelled you to donate your speaking engagement earnings to the AIGA DC Continuum Fund? Being in DC and seeing the potential of design community and student talents we have I hope that it will better programs and elevate DC even furthter as a creative hub. And we like to give back – AIGA DC Continuum Fund is great place to give. Why do you enjoy about being a donor to the AIGA DC Continuum Fund? Seeing a talented designer have the opportunity to be even better – it’s a tough market these days and every/any advantage will be needed to make it. What would you say to someone thinking about donating to the fund? Why should someone donate? Why not? If you are going to give why not give to a good cause you are passionate about. We get called on by all sorts of organizations and while we do give to some, we will really look each one and how it will or will not impact our daily lives. Design is our life here at Design Army. The AIGA DC community looks up to Design Army because of their involvement with causes and the opportunities they achieve in the design industry. To know that they care enough to donate 100% of their speaking and judging fees to the AIGA DC Continuum Fund means a lot to the future of design.